1 PREHEAT oven to 375°. Spray 8 or 9-inch square baking dish with no-stick cooking spray; set aside. Finely chop pepper tops; set aside. 2 HEAT large nonstick skillet over medium-high and cook chorizo and corn until corn begins to turn golden and chorizo begins to brown, about 5 minutes. Add ground beef and cook until browned. 3 STIR 2 cups water, Knorr® Fiesta Sides™ - Spanish Rice and chopped pepper tops into skillet and cook according to package directions. Stir in 3/4 cup cheese and let stand 2 minutes. 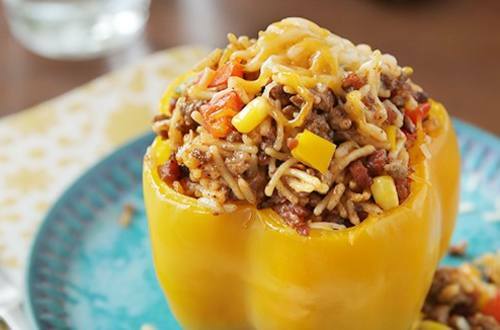 Evenly stuff peppers with rice mixture and arrange in prepared baking dish. Add 2 tablespoons water to baking dish and cover tightly with foil. 4 BAKE 45 minutes or until peppers are tender; sprinkle peppers evenly with remaining 1/4 cup cheese and bake 2 minutes or until cheese melts.